Get your PERSONALISED weight-loss diet plan today! A Personalised Whole-Food Plant-Based Meal Plan. Sign up today for €26.10 for your specifically tailored protocol. A Protocol That Actually Works. The diet consists predominantly of beans, legumes, nuts, seeds, fruits and vegetables. Plant Based News Backs the NFI Protocol - Here's Why. Put simply, the NFI protocol takes the guesswork out of nutrition and guarantees the best possible outcomes for individuals. We looked at the results and found them to be unprecedented. For example, the protocol is currently being tested in a large clinical trial in Slovakia where the tailored meal plans have resulted in a 97.2% type 2 diabetes remission rate after only 20 weeks. That’s right - the vast majority of type 2 diabetic patients that have followed the NFI diet have gone into remission. This success rate has never been seen before in the scientific literature and we wanted to share it with our audience. Vlasto (testimonial above) provides one example. After just 5 weeks, his average blood glucose dropped dramatically and now no longer suffers from type 2 diabetes (daily blood glucose has decreased from 8.9 to 4.9% and off all medication). It is important to note that Vlasto achieved full remission whilst still in the obese BMI category. This is particularly relevant because it counters the conventional narrative that type 2 diabetes reversal only occurs due to loss of excess body weight. The NFI diet is a whole-food plant-based diet that goes one step further, by mixing and matching different plant foods in combinations that are tailored to an individual person. It was developed by scientists and engineers in Europe who looked at the molecular interactions of thousands of specific foods to understand how they affect lipid saturation and other relevant markers in different patients. 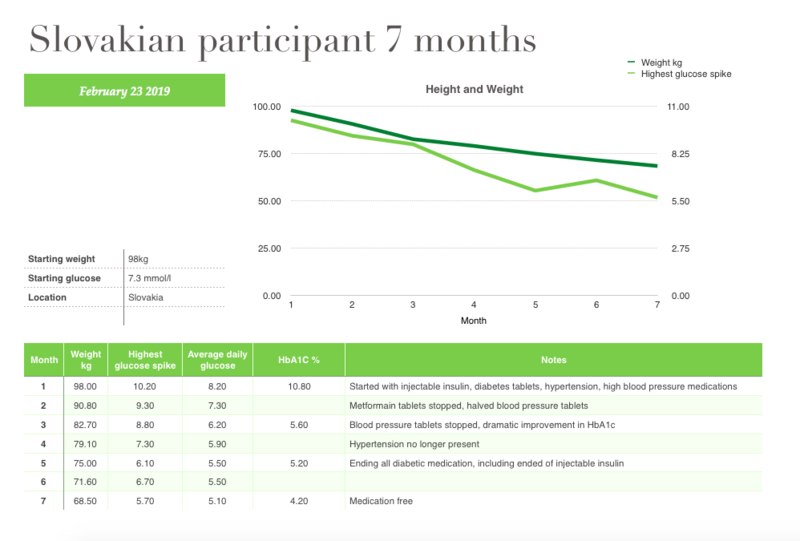 Dr. Janka Lejavova has spoken (above) about the success of the first ever patient on the NFI diet (results also shown in graphic below). The diet has been nutritionally approved by specialists in a number of countries. One thing that surprises most people about the diet is the rapid weight loss, despite patients enjoying unlimited calories. For example, Vlasto (testimonial above) lost 24kg after 13 weeks on the NFI diet. For The Best Outcomes: Important Instructions. It is very important to input the exact data measurements that are requested during the set up phase. If the data inputted is not accurate, it will mean the effects of the NFI diet will be slower. Due to changes in your weight and potentially other data points, the plans will need to be recalculated every two weeks. This specific tailoring ensures that you get maximum improvement during the following two weeks. The plan has to be followed exactly, whatever is written on the diet plan has to be eaten. You do not have to always eat the exact prescribed amounts but you must consume what is on the plan to get the benefits. An example being if an orange is on a specific meal plan, eat at least half of it, if you can not eat all of it. The reasons for this are the chemicals present in the orange will not be present in your body if you do not eat them and subsequently you will not get the desired chemical effect after that meal. The order of the days that are specifically prepared must be followed in their exact order, for example eating an avocado on Monday will supply your body with a specifically desired chemical compounds which will be needed on Tuesday to boost the reaction between the other food groups. From a meal timing point of view, it is also important not to swap lunch with dinner for reasons explained above. IMPORTANT NOTE: If you’re interested in foodie / gourmet meals, this meal plan is not for you. This is a very strict clinical diet, which includes only simple foods, designed with chemistry in mind, to help you lose weight and reverse lifestyle disease. Only consider purchasing this meal plan if you want results and are serious about complying 100%.